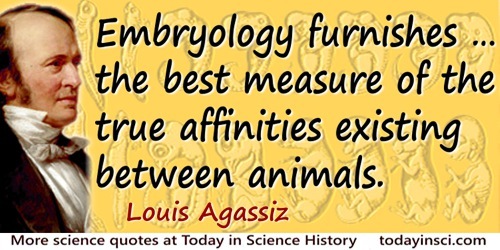 Embryology furnishes … the best measure of the true affinities existing between animals. In 'Essay on Classification', Contributions to the Natural History of the United States of America (1857), Pt. 1, 85. From the point of view of the physicist, a theory of matter is a policy rather than a creed; its object is to connect or co-ordinate apparently diverse phenomena, and above all to suggest, stimulate and direct experiment. It ought to furnish a compass which, if followed, will lead the observer further and further into previously unexplored regions. The Corpuscular Theory of Matter (1907), 1. God having designed man for a sociable creature, furnished him with language, which was to be the great instrument and tie of society. In An Essay Concerning Human Understanding (1849), Book 3, Chap 1, Sec. 1, 288. 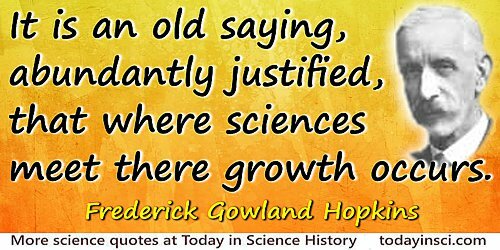 It is an old saying, abundantly justified, that where sciences meet there growth occurs. It is true moreover to say that in scientific borderlands not only are facts gathered that [are] often new in kind, but it is in these regions that wholly new concepts arise. It is my own faith that just as the older biology from its faithful studies of external forms provided a new concept in the doctrine of evolution, so the new biology is yet fated to furnish entirely new fundamental concepts of science, at which physics and chemistry when concerned with the non-living alone could never arrive. 'Biological Thought and Chemical Thought: A Plea for Unification', Linacre Lecture, Cambridge (6 May 1938), published in Lancet (1938),2, 1204. Mutations merely furnish random raw material for evolution, and rarely, if ever determine the course of the process. From 'Fisher and Ford on the Sewall Wright Effect', American Scientist (Jul 1951), 39, No. 3, 452. 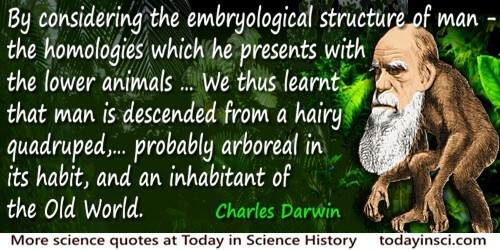 Collected in Sewall Wright and ‎William B. Provine, Evolution: Selected Papers (1986), 515. Other things being equal, the investigator is always the best instructor. The highest grade of instruction in any science can only be furnished by one who is thoroughly imbued with the scientific spirit, and who is actually engaged in original work. 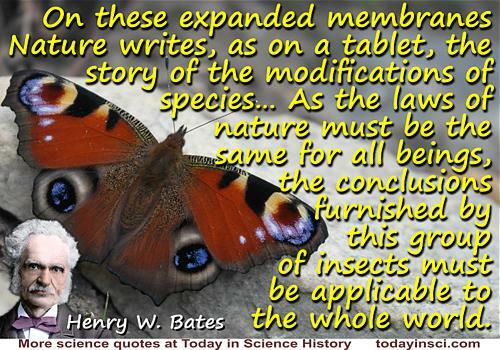 Quoted in Frank R. Lillie, The Woods Hole Marine Biological Laboratory (1944), 37-8. Scientists still do not appear to understand sufficiently that all earth sciences must contribute evidence toward unveiling the state of our planet in earlier times, and that the truth of the matter can only be reached by combing all this evidence. ... It is only by combing the information furnished by all the earth sciences that we can hope to determine 'truth' here, that is to say, to find the picture that sets out all the known facts in the best arrangement and that therefore has the highest degree of probability. Further, we have to be prepared always for the possibility that each new discovery, no matter what science furnishes it, may modify the conclusions we draw. Surround truth with bitter denial and contradiction and you furnish it with the soil for its permanent growth. As quoted in A.V. Morganstern, 'Misokainia', The Medico-legal Journal (1906), 24, 439. Caveat emptor! Webmaster has not yet been able to find this wording in a primary source by Carlyle, and reserves judgment on its authenticity. It is included here as an interesting aphorism, even if the authorship is uncertain. Perhaps Carlisle expressed the idea in a longer quote, which has been popularly summarized as shown here. If you know the primary source, please contact Webmaster. Vedanta Philosophy: Five Lectures on Reincarnation (1902), 41. The component parts of the pistols are to correspond so exactly that any limb or part of one Pistol may be fitted to any other Pistol of the Twenty thousand. Requirement in an 1813 contract with Simeon North to furnish 20,000 pistols. S.N.D. and R.H. North, Memoir of Simeon North (1913), 81. Quoted in Joseph Wickham Roe, English and American Tool Builders (1916), 134. We modern chemists, the witnesses and workers of this “Age of Chemistry,” can learn something from the old alchemy, full as it was of errors and fantasies! … Let the Past furnish us a warning against too much phantasy in modern chemistry. From 'What Can the Modern Chemist Learn From the Old Alchemy? ', Introductory Lecture (1917), delivered at Cornell University, written in German, translated by L.F. Audrieth, and published in Salts, Acids, and Bases: Electrolytes Stereochemistry (1929), 1-2, as Vol. 4 of the George Fisher Baker Non-Resident Lectureship in Chemistry at Cornell University.